Celebrating the opening of the first #Fendirumi pop-up at Harrods, Fendi is celebrating with Piro-chan and Bug-kunon, the Fendirumi themselves! Coming soon in August, the duo pays homage to the Japanese phenomenon of kigurumi mascots. Inspired by the QuTweet bag charm, the sweet, girly-pink Piro-chan has large yellow eyes, a blue crest and features the FENDI logo. Bug-kun is boyish blue, with an attitude, and is inspired by the much-loved Bag Bugs charm with its yellow crest and double FF logo. These two are coming to Harrods on August 4, 2016. 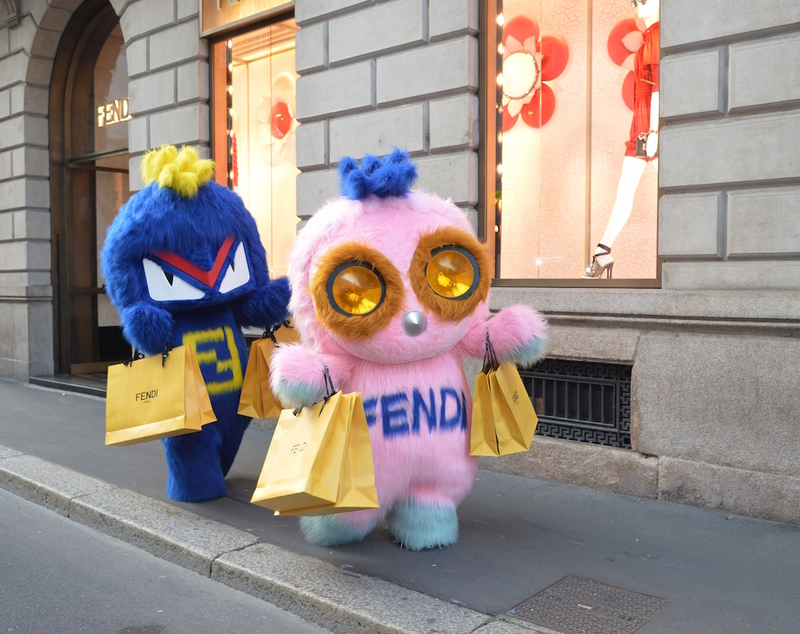 “Japanese pop culture and kigurumi-mania gave me the idea of having two Fendi mascots to attend our events, shows and openings. The Fendirumi embody the spirit of Fendi Fun,” says Silvia Venturini Fendi. Visitors to the pop-up will enter the Fendirumi world, a space of fun that reflects the furry characters’ personalities. Hundreds of bell jars with rotating miniature Fendirumi will line the walls. Exclusive products including the two bag charms inspired by the Fendirumi are miniature versions of their full-size counterparts, recreated in Fendi fuzzy luxury. These and a range of other exclusive-to-Harrods products, including croco-steel bags in vibrant shades, Mini Dotcom Click pieces and Strap You variations inspired by the Fendirumi, will be shown at the pop-up. #FENDIRUMI popup at Harrods coming soon, August 4th.